Researchers who have modeled planetary systems far beyond our own solar system have found that massive moons larger than Mars might be the best bet. Using data from our solar system and observations of huge planets far beyond the visual range of any telescope, astrophysicists René Heller and Ralph Pudritz of McMaster University have shown that some moons of those planets could be habitable. Their findings, presented in two papers in the journals Astronomy and Astrophysics and The Astrophysical Journal, suggest that some moons of exoplanets — planets beyond our solar system — are the right size, in the right position and have sufficient water to support life. "We could be just a few decades from proving if there is life elsewhere," says Heller, a post-doctoral fellow at McMaster's Origins Institute who worked with Pudritz, a professor of physics and astronomy and director of the Origins Institute. "For all this time, we have been looking on other planets, when the answer could be on a moon." Exoplanets are being counted in the thousands since the development of new, non-visual methods that allow scientists to prove their existence by measuring light patterns from sun-like stars that dim slightly as the planets pass in front of them in orbit. Many planets outside the solar system are even more massive than Jupiter, and they orbit their Sun-like stars at an Earth-like distance, but these faraway super-Jupiters are effectively giant gas balls that cannot support life because they lack solid surfaces. Their moons, though, might have the right conditions for liquid surface water and therefore for life to emerge and evolve. While recent research has focused on exoplanets, the McMaster authors are eager to study the moons of those giant Jupiter-like planets, which they believe to have migrated into more temperate ranges of distant stars, towing watery moons in their orbits. Closer to home, Heller and Pudritz modelled the early life of Jupiter, revealing a pattern of ice distribution on Jupiter's moons that led them to predict the formation of moons around the super-Jupiters of other solar systems. Those moons could be twice as massive as Mars. With about 4,000 exoplanets known to exist so far, and with increasing technological capabilities, an exomoon discovery is now looming on the horizon. If these giant moons around giant planets exist, they might already be present in the available data of NASA's Kepler space telescope, or they could be detectable with the European Space Agency's upcoming PLATO space mission and European Southern Observatory's ground-based European Extremely Large Telescope. 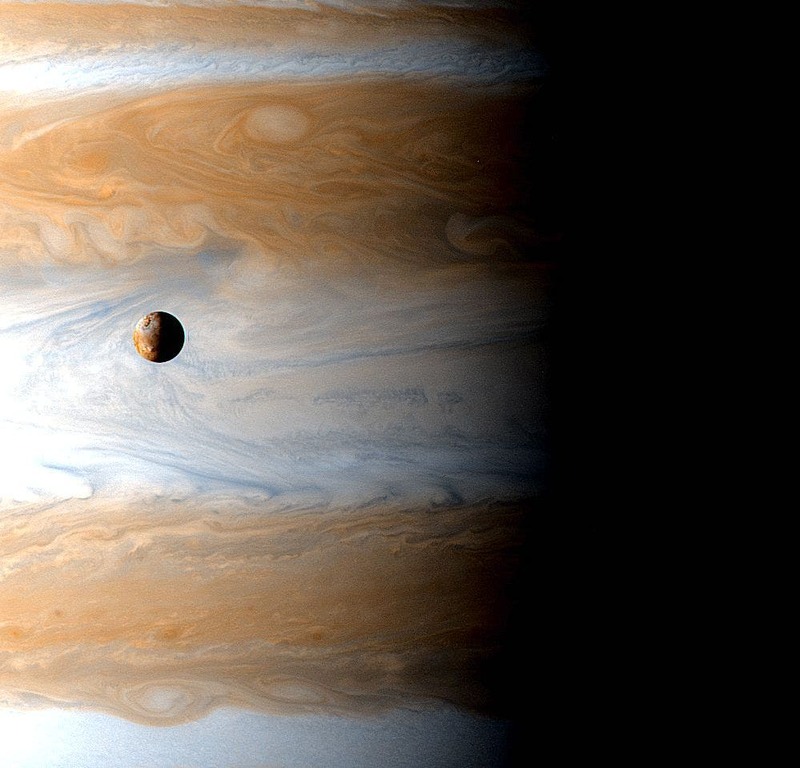 Image at the top of the page shows Jupiter's moon Io captured on January 1, 2001 10:00 (UTC) by Cassini Orbiter during the Cassini-Huygens mission. With plumes of matter rising up to 186 miles (300 km) above the surface, Io is considered a prime candidate as a hotspot for extreme extraterrestrial life.